Guiding principles are wonderful things – if you have them. Too many of us as individuals and organizations have not fully articulated our guiding principles. 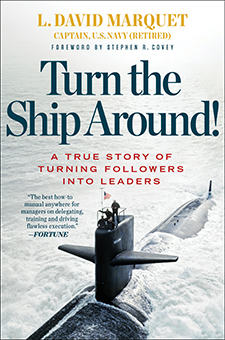 In his book Turn This Ship Around!, author L. David Marquet lists the guiding principles he and his team developed while he was commander of the attack submarine the Santa Fe. You need to get the book and read the full explanation of each of these to appreciate their power. The key point is that establishing a set of clearly, and often, communicated guiding principles was one of the ways he took one of the poorest performing submarines in the fleet to one of the best, if not the best, in the fleet. So what are your guiding principles for your organization? At the end of the week, Lauren will be sharing how you develop your own personal set of guiding principles.